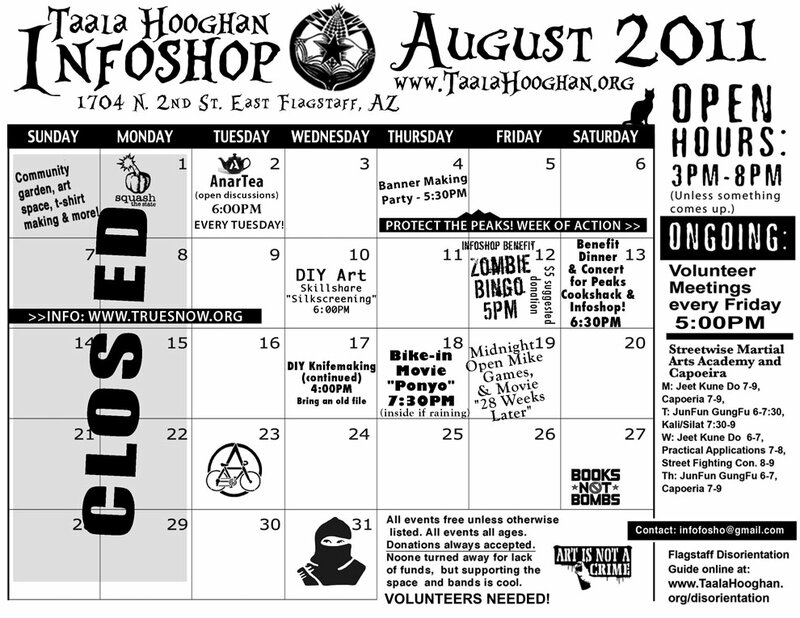 Home » Feature » TAALA HOOGHAN INFOSHOP – AUGUST 2011 EVENTS CALENDAR, PEAKS WEEK OF ACTION, & FUNDS NEEDED! As many of you know, all of the folks who keep Taala Hooghan Infoshop open have been deeply involved in efforts to protect the Holy San Francisco Peaks (www.TrueSnow.org). So much so that we’ve struggled to maintain consistent hours as the Peaks have been our priority. We have kept doors open mainly to facilitate support for those coming from out of town to travel to basecamps on the Holy Mountain. Although we haven’t been open for book-sales or fund-raising events, we’ve managed to receive $323 in donations in July! This is where we need your help — in order to sustain our efforts we are reaching out to you to raise the remaining $377 needed to pay our rent. Please contribute what you can by making a donation at the infoshop or through our website: www.TaalaHooghan.org. Any amount helps! You can also donate sell-able items you dont need anymore. We also have recently changed volunteer and collective meetings to be held on the same day. Volunteer meetings will take place at 5:00PM. The agenda will be: Orientation, Announcements/Updates, Events/Calendar/Staffing, Work. Collective meetings will be held immediately following but are not open to public. Non-collective members may be welcome to sit in upon request. Please join us for the PROTECT THE PEAKS! 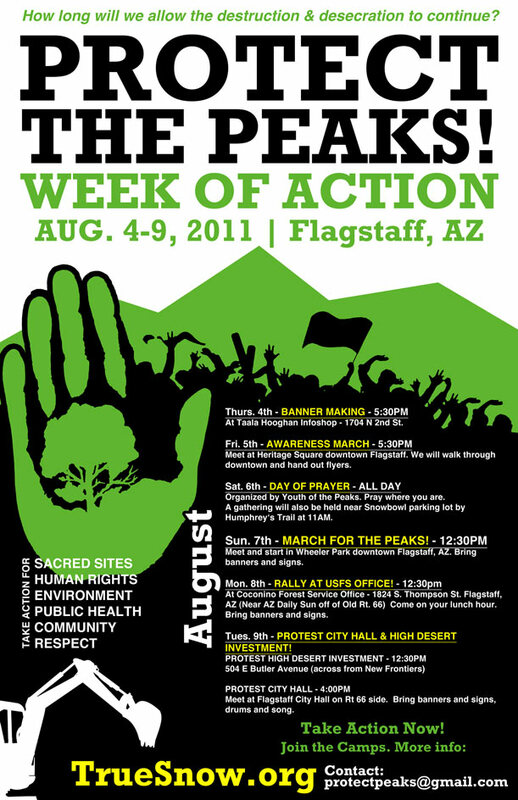 WEEK OF ACTION Aug. 4-9 – www.Truesnow.org. This is a critical time to ensure that the Peaks are protected for future generations. CLOSED SUNDAY & MONDAY for AUGUST! Come learn what you can do to be part of this space! Open discussions for the Anarchist and Anarcho-curious. Bring paints and sheets if you got ’em, otherwise we got lots of supplies! Learn how to print your own tshirts or patches. Sat. 13th – Benefit Dinner & Concert for Peaks Cookshack & Infoshop! $12 for dinner & show – $10 for dinner, $5 just for show. Last time we talked about stock removal methods, we’ll continue there and demonstrate forging as well. Bring an old file if you want to try. Ponyo is a young fish-girl who loves to explore, but her father, a great wizard of the sea, fears the chaos her untamed powers could unleash upon the world. 3 Year Anniversary Celebration! 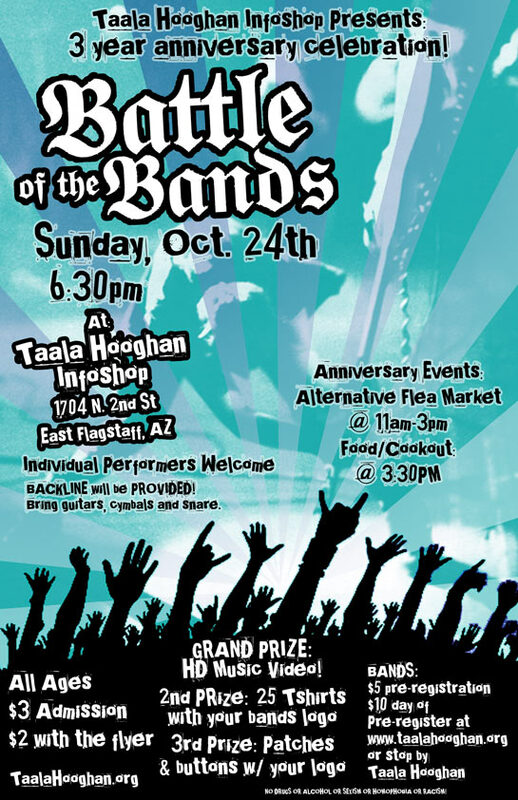 Battle of the Bands! 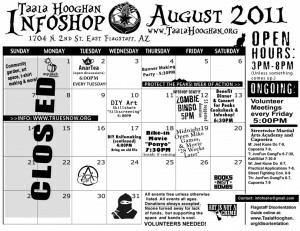 Previous post Taala Hooghan Closed for July except for events — no calendar this month!